I love barre & I love babies so what could be better than the thigh shaking workout that is Dailey Baby!? Barre was one of my favorite workouts throughout my pregnancy, so I’m no stranger to squatting, tucking and squeezing with extra weight and Dailey Baby does everything right. Today was my third Wednesday in a row joining fellow moms of infants at the Dailey Method Carlsbad for this calorie torching strength training workout and it’s safe to say I’m addicted. 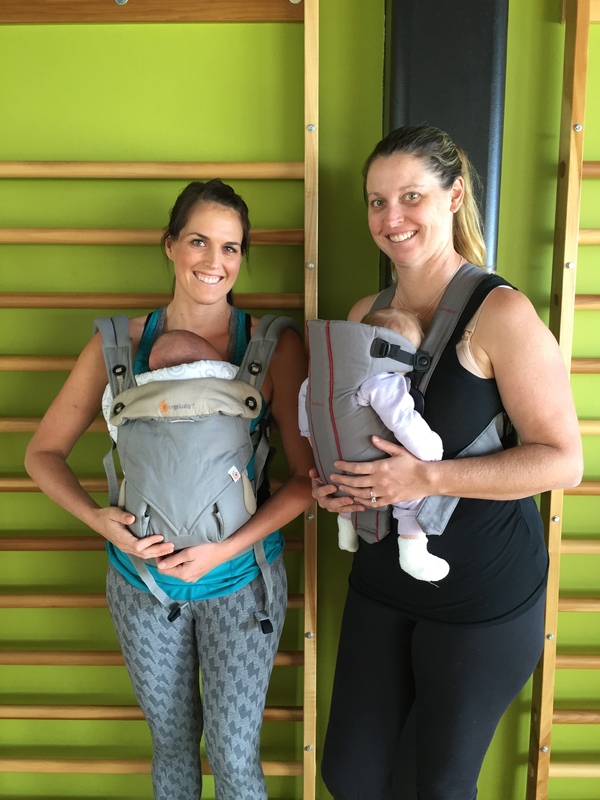 Dailey Baby is a 45 minute “Mommy and Me” class held at the Dailey Method Carlsbad on Wednesdays at 12:15 (it’s also taught at other locations so check out your local TDM if you aren’t in San Diego). All moms of a baby between 6 weeks and 7 months are welcome to join and the first class is absolutely free! TDM Carlsbad also has childcare so moms of more than one child can enjoy class with the baby while the other children are looked after by professional childcare staff. Even as someone who has tried countless new fitness studios over my lifetime, I was a bit apprehensive to bring Siena to this class. Historically she hasn’t LOVED the baby carriers (we have the Moby and the Ergo) and I was worried about her crying and creating a disturbance. Allison, the teacher and a friend of mine, reassured me that it’s totally ok for babies to cry and that it happens without fail at every single class. Breastfeeding during class is totally fine if necessary as well. After hearing this, I decided to face my fears and come to class! With my friend Amber and our babies who are only 2 weeks apart! Class begins with all babies in the carrier. The warm-up involves squatting or another movement that is bouncy and helps the babies calm down or fall asleep. After the warm-up is an arm series with light weights, followed by 8 minutes of thigh work at the barre, stretches and then another 8 minutes of seat (aka glute) work at the barre. 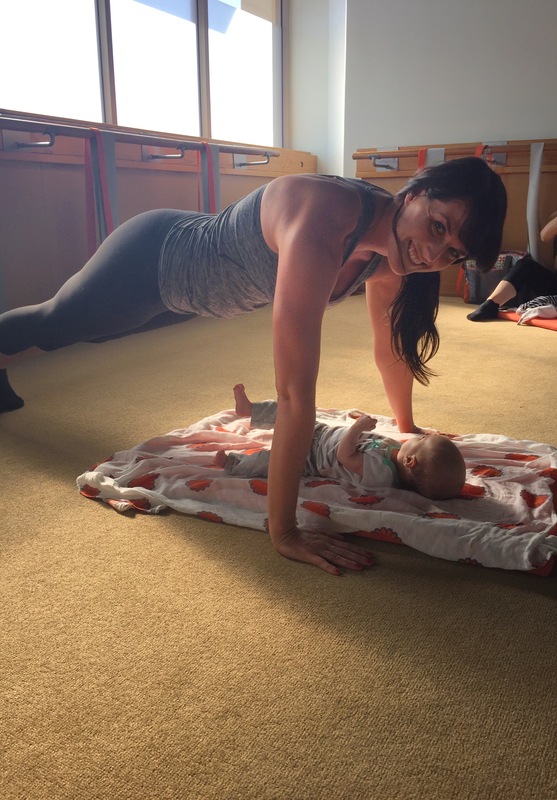 After this, babies come out of the carriers and we do planks, push-ups and abdominal exercises that incorporate baby into the moves (such as planking over them, kissing their foreheads as you do push-ups). Depending on the size of the baby, the baby will be more or less involved. Some babies just end up crawling around the room during this portion! Siena was 8 weeks old at my first class. I decided to use the Ergo and ended up not using the infant insert since she is so long (you should be able to kiss the top of their head). Despite being on a feeding schedule, I made sure to top her off with some more milk right before class so that she’d be fed and happy. Luckily it worked and she fell asleep in the Ergo and then was a happy girl once we got to the mat for the final 15 minutes of planks, abs, push-ups and stretching. I used the moby wrap for the second class and it didn’t go as well. I ended up having to nurse her in the wrap during the leg and thigh series and she cried during the floor series so I pretty much had to skip it, but it was still a great time to be with other new moms and I didn’t feel judged at all for having the crying baby ! The workout itself is beginner friendly but also intense for anyone really wanting to feel the burn. 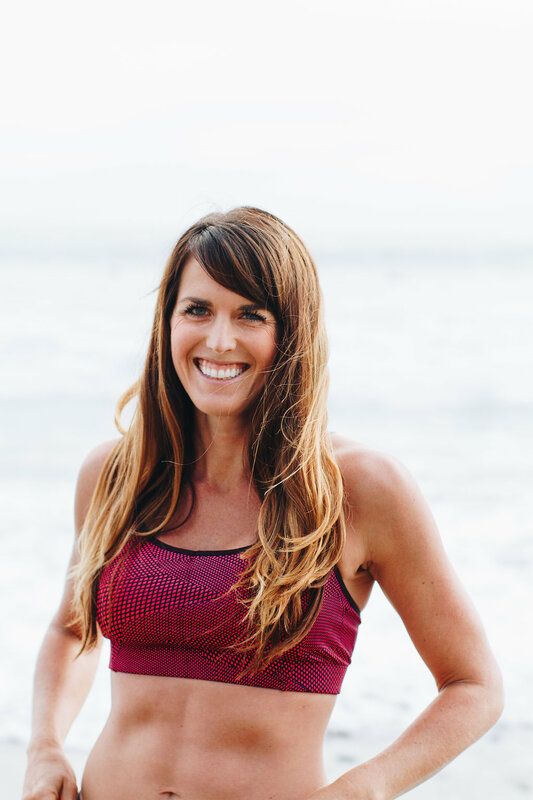 Allison is a great instructor and doesn’t take it easy on us, encouraging us not to give up or take breaks during the moves (the 8 minute of glute work is seriously brutal!). The result is that I leave class feeling like I had a great workout and I get to have some skin to skin and bonding time with Siena. Not to mention the benefit of meeting up with fellow moms who are all going through the same thing are you. It’s a win-win! If you’re planning on coming to class, remember to bring a pair of socks (any socks will do, though most will have barre socks), your baby carrier and a blanket for baby. And get ready to sweat! 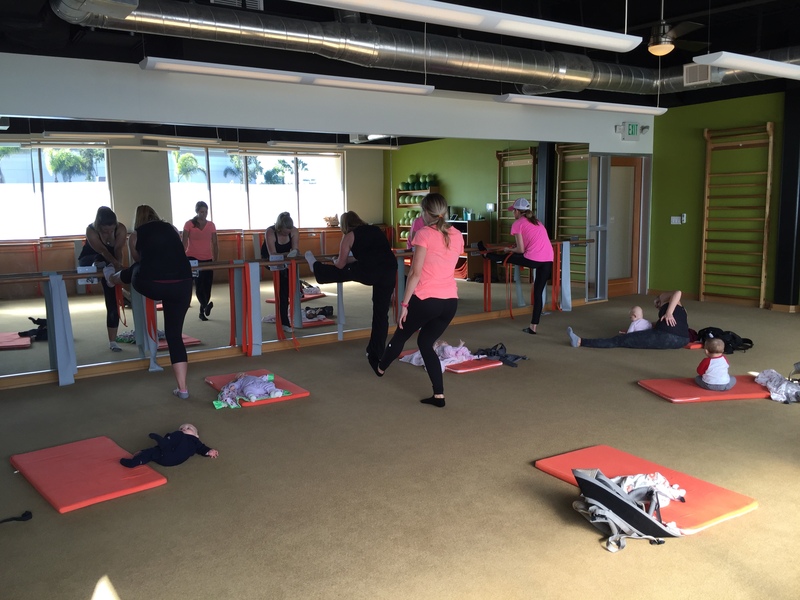 Have you or would you ever do a mommy and me type workout class? This sounds like so much fun! I love the stroller strides class I take with Allie. It’s basically a circuit workout + pushing the stroller. BTW, you look great!! Thanks! There is a stroller strides class that meets down the street from my house – I’m going to try it once my neighbor is 6 weeks pp so we can do it together ! I hope when I have kids there is a class like this near me. This looks like so much fun. What a great way to workout and keep your baby with you. Fun! I wish there was something like this near my house! Love reading your blog. Although, my daughter is 6 years-old now – I plan to use your workouts and blog as motivation after my back surgery Jan. 15. Ready to get back to triathlons and running. Check upper right corner of pic. Nothing wrong with it just FYI. OMG ha! Good eye!!!! I totally think I posted this to instagram too. EEK! We don’t have anything like this in town. 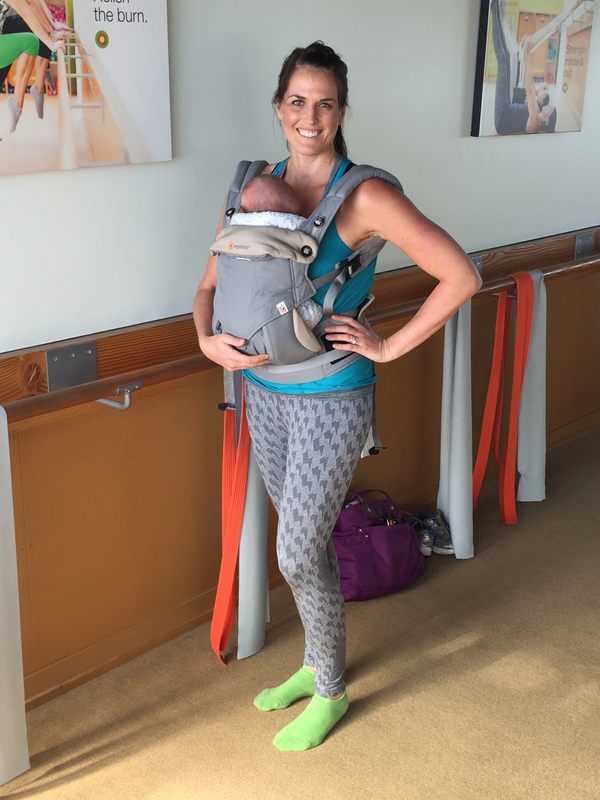 Maybe Bend is too small for mom+baby workout classes. Guess I will just have to pack Axel up and fly down to San Diego! 😉 You look great. I love the Oiselle bolt tights. I have the matching top in that same color. So comfy. I was going to ask where you got the tights but someone already commented. I love them and might have to buy myself a pair after the holidays! Great job getting back into working out! I know it’s hard on limited sleep. In Boston we also have mommy and me yoga classes. I don’t have a kid but I share them with all my friends because they sound like a great idea to me! The struggles are coommn, girl. Do your best to be kind to yourself (don’t beat yourself up mentally, but rather love yourself mentally). BTW: My friend was a certified Cardio Barre instructor when it first came out several years ago and she has a dancer’s body. I have several who are addicted to those classes. They are supposed to be great for your core.